Aparna, who is married to Mulayam Singh's son Prateek, said she would be contesting the 2019 elections from the PSPL but her father-in-law's blessings are with her. 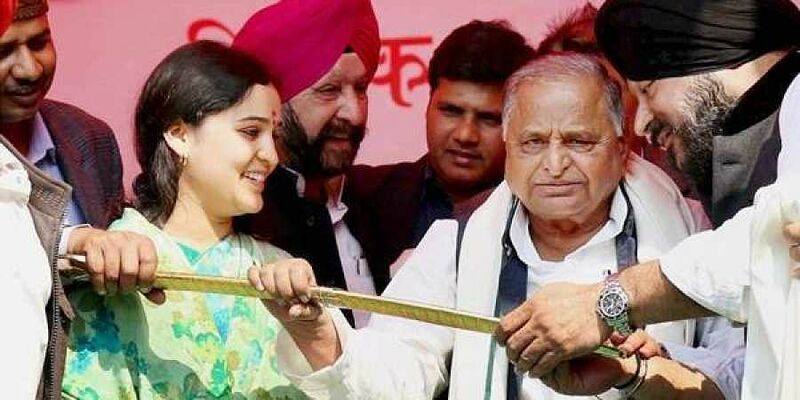 LUCKNOW: SP partriarch Mulayam Singh Yadav's younger daughter-in-law Aparna Yadav has joined the ongoing temple debate by expressing her views in favour of the construction of Ram temple in Ayodhya but only after the order of Supreme Court of India. "Like everyone else, I also want a Ram Temple in Ayodhya. I am in favour of temple and it should be built as Ayodhya finds a mention in the Ramayana," she said while addressing a gathering at the Dewa Mela in Barabanki on late Wednesday night. Later talking to media persons in the state capital on Thursday, Aparna reiterated her stand over the temple issue with a dash of philosophy. "Ram is an idea, a thought. We should not restrict him to a single religion." However, she added that she had full faith in judiciary and since the matter was sub-judice, she would respect the order of apex court before which the vexed issues had been pending since 2011. Notably, the Supreme Court heard the case for four minutes on Monday and deferred it to January, next year, saying an appropriate bench would decide the schedule of hearing in the issue. When asked if she was on the same page as the BJP over the temple issue, Aparna evaded a direct reply saying: "I am with Ram." Aparna, who had contested the 2017 UP assembly polls from Sadar segment in state capital unsuccessfully, had recently come out in open support to rebel SP leader Shivpal Yadav. She had taken the vow to strengthen the hands of Shivpal and his Smajwadi Secualr Morcha. She had even expressed her willingness to contest 2019 Lok Sabha election on a ticket given by Chachaji (Shivpal). Aparna, who is married to Mulayam Singh's younger son Prateek, said on Thursday that she would be contesting the 2019 elections from Shivpal's Pragatisheel Samajwadi Party Lohia if her father-in-law would want her to do so. When asked over her support to Shivpal, Aparna said, "I am with Netaji (Mulayam) and will proceed further only on his advice." However, she accepted the fact that division in Samajwadi Party would dent its prospects in 2019.